Today I’m here to share this super cute, printable Thanksgiving banner with you. The letters spell out “thankful” using hues of red, gold, turquoise, and brown. Download the banner at the bottom of this post. Now that October has come and gone, it’s time to focus on Thanksgiving. I think people have a tendency to skip straight to Christmas after Halloween and let’s not do that! As I’ve mentioned in years past, Thanksgiving is my favorite holiday. 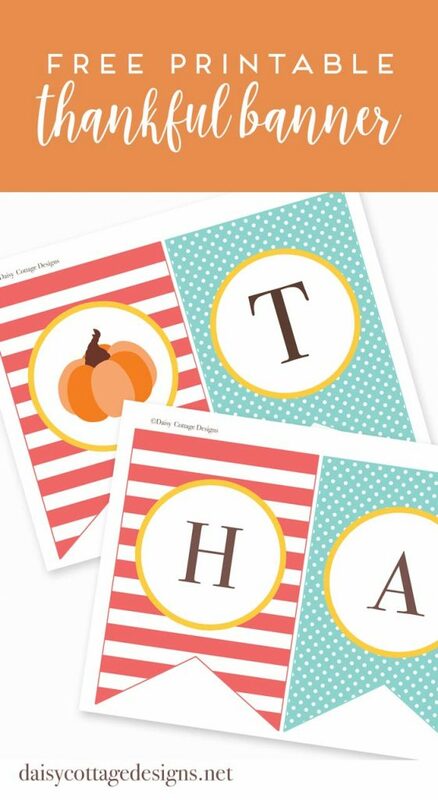 I love all the fun thanksgiving printables, the delicious pumpkin recipes, and cozy boot cuffs. Not to mention thanking God for all the wonderful things He’s given me and spending time with my family and very closest friends. While we’re on the subject of Thanksgiving printables, last year’s Thanksgiving printable was popular, and I’ve enjoyed seeing how some of you have used it in your home. 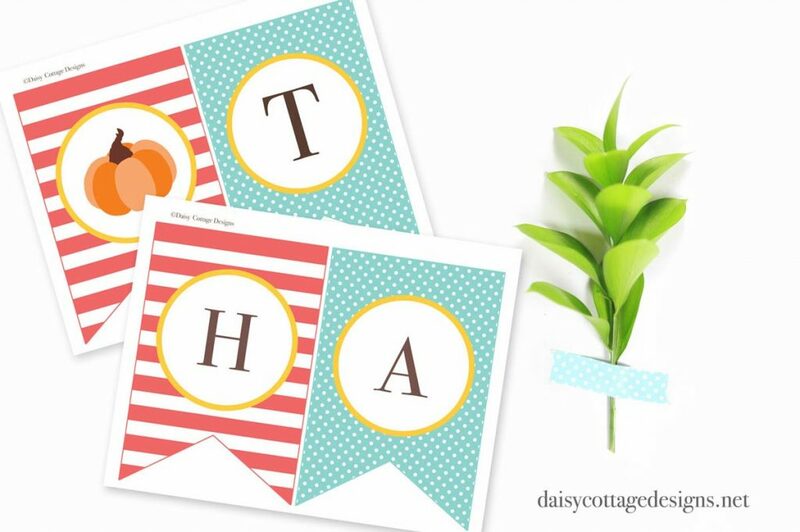 Please use #daisycottagedesigns on Instagram to share the cute ways you decorate your home using the Daisy Cottage Designs printables! While the traditional fall hues are beautiful, I definitely lean towards brighter colors – I thought this combination of a fun red, turquoise, and gold were the perfect way to brighten up my home and keep the fall decorations fun and fresh. You can download the bunting printable below. I recommend using heavyweight card stock; so once you’ve got that loaded in your printer, simply print, trim, and hang with ribbon or twine! I am not able to get the h/a page to come up. When I click on it I get the first page again. This is so cute, Lauren! This is so cute, Thank you for sharing. Thanks for this fun printable! I am going to throw a little Thanksgiving activity for my kids and their friends this next week so this banner will be great! Random question… what type of printer do you have? I usually go to FedEx to print things but I think now it is time to buy myself a printer. 🙂 Do you have any recommendations?